We design and install Outdoor Kitchens and BBQ Island Grills in any size, shape and finish that you desire. We also offer a full line of grills with both traditional and infrared technology for the serious outdoor chef. We are an authorized dealer for Vermont Castings Signature Series, Fire Magic, Luxor, and Solaire Infrared built-in grills. We also carry accessories for your outdoor kitchen: side burners, sinks, refrigerators, ice makers, storage drawers, access doors, and more. With over 50 custom outdoor kitchens installed, there's no other company more equipped to install your dream outdoor living space then Backyards Plus. We also have 30 years of experience in running gas lines for your kitchens. Call any time week day or weekend. Which grills and appliances can be used in an outdoor island kitchen? We can build a custom surround for your existing grill or you can choose from the Vermont Castings Signature Series, Solaire Infrared, or Fire Magic or Luxor models. 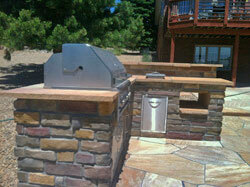 Our outdoor kitchens can include side burners, sink, refrigerator, drawers, cabinets, smokers and audio systems. What kind of materials are used and which shapes/colors are available? We put the kitchen together on site, so there is no limitation to size and shape. We start with a frame then skin it with water proof Dura-Rock. Next, we apply the finish (veneer stone, brick, stucco, etc.) or you can choose our popular concrete overlay, which gives the appearance of stone or rock. For the counter top you have a choice of outdoor-grade granite, marble, flagstone, tile, or our concrete overlay top, which can be made to look like stone, marble, or completely customized. Is there a warranty on workmanship as well as the appliances? All Backyard Plus installation projects come with a one-year workmanship warranty. The appliance warranties vary depending on the brand and model chosen.